Screenwriter Taylor Sheridan reunites Benicio del Toro and Josh Brolin for the sequel to 2015's Sicario. When the United States realize that terrorists are being smuggled across the Mexican border along with illegal immigrants, Matt Graver's (Brolin) team is brought in to deal with the problem. Wanting to start a war between the cartels, Graver decides to bring back Alejandro Gillick (del Toro) who a personal grudge against one of the cartel leaders. Stefano Sollima steps in for Denis Villeneuve (who directed the first Sicario) this time around. Since Sicario is easily my favorite of Villeneuve's films, I was sorry to not see him return. The biggest difference between Sicario: Day of the Soldado and the original is the lack of female lead. Filling that spot is the side story featuring Elijah Rodriguez a young wannabe on the Mexican border (which is never as compelling as it should be). The sequel definitely misses Blunt as the only female characters of import are Catherine Keener as Graver's boss and Isabela Moner as a cartel princess whose abduction becomes part of Graver's larger plan. While both are important to the plot, it's really del Toro's movie this time around. Some have objected to the sequel even offering an opportunity for Alejandro to be redeemed. Given the moral relativism on display in both Sicrio and the sequel, I have no issue with the character's arc. Our "heroes" and their actions are at least as troubling as the actions of those they are fighting. In terms of story, however, I do think the follow-up feels a bit more by-the-numbers than the original (there's influences from several films here including Clear and Present Danger), and relies a bit too heavily on a single coincidence that the final act of the film hinges upon. That said, the sequel provides strong performances from everyone involved and the same intensity of the original. 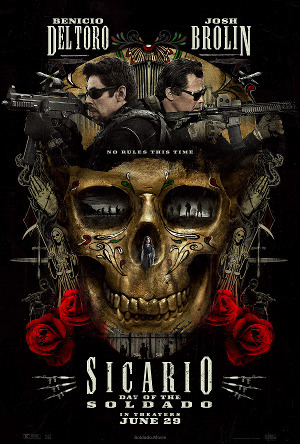 In the end, if Sicario: Day of the Soldado is nothing more than a good sequel to a very good film that opens up the world for other possible stories to be told, that alone is far more than most sequels ever accomplish.